Companies with engaged employees outperform those without by up to 202%, So, how do you foster better collaboration? As Andrew Carnegie once said, “Teamwork is the ability to work together toward a common vision.” This is perhaps never more important than in the workplace, where you throw a group of unrelated individuals together and expect them to easily communicate and work together. How do you foster better collaboration? If you want your employees to work together and collaborate, you need to establish a corporate culture that emphasizes teamwork. And it all starts with you. According to the University of Oregon’s Holden Leadership Center, businesses should strive for open communication between employees and management. This open relationship between employees and management helps sets the tone for better communication amongst employees. It is not always enough to emphasize teamwork and collaboration; it also helps to reward such things. If you notice results from good collaboration between employees, send out an email recognizing their achievements. Let it be known that you value teamwork. When you do this, it helps reinforce that good behavior in your employees. It is important to encourage all of your employees to collaborate, not just the ones that are comfortable with one another. So, it is up to you, as the manager or employer, to stir the pot a little. Mix up the teams at work and encourage collaboration amongst employees that do not typically interact. One way to shake things up a bit is via team building. 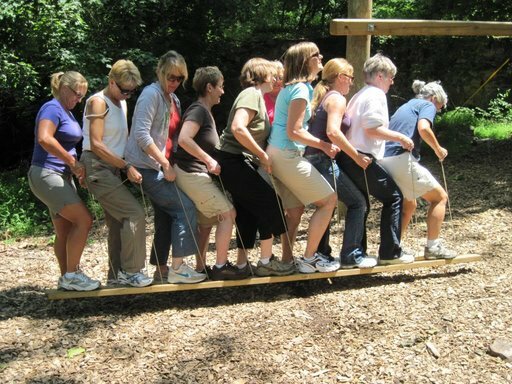 Presented in a fun and creative way, team building exercises help break down communication barriers and encourage collaboration amongst your employees – ALL of your employees. Conveniently located between Baltimore and Washington DC, Terrapin Adventures is able to create a customized program (onsite or offsite, indoor or outdoor) that help your staff work efficiently and cohesively as a productive unit. Our custom programs provide for exciting activities that bridge the gaps in communication, improve collaboration, and expand your group’s problem solving skills. If you have any questions about Planning a Corporate Retreat, please call Terrapin Adventures at 301.725.1313, or email us at info@terrapinadventures.com to learn more. We are open Friday through Sunday for recreational guests and every day for groups. This entry was posted on Friday, September 18th, 2015 at 2:51 pm. Both comments and pings are currently closed.